Older Americans love certificates of deposit. But fixed-rate annuities, which function like CDs, usually pay much higher guaranteed rate. And they offer tax deferral. CDs have one main advantage over annuities: they’re insured by the FDIC. But I think it’s a tiny advantage, all things considered. Fixed annuities are guaranteed by life insurance companies, which are strictly regulated by the states to ensure solvency. And fixed annuities are also protected, by state guaranty associations up to certain limits. Fixed-rate deferred annuities are also called multi-year guarantee annuities or CD-type annuities. Like CDs, they provide a set, guaranteed interest rate for a stated period of time, usually three to 10 years. As with a CD, there’s no sales charge. Whether you deposit $10,000 or $100,000 in a fixed annuity, all of it goes to work for you immediately. Here are the main ways fixed-rate annuities beat CDs. Substantially higher rates, sometimes more than 1/3rd higher. The highest-paying five-year CD was recently yielding 2.45 percent versus 3.30 percent for a five-year annuity. That’s 34.7 percent more. Tax-deferral. All CD interest is subject to federal and state income tax annually, even when it’s reinvested and compounded in the CD. A fixed annuity is tax-deferred. You won’t receive an annual 1099 and you won’t pay tax on the interest until you withdraw it. 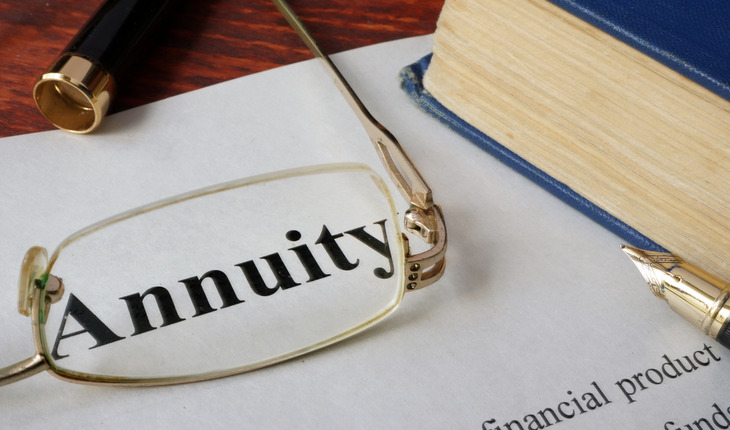 At the end of the annuity’s initial guarantee period, you may renew it for another term or roll it over into another annuity to continue deferring taxes. Tax deferral doesn’t apply when you hold an annuity in an IRA or other retirement account because those accounts are already tax advantaged. Since you get a guaranteed, competitive rate, they’re still a top choice for the portion of your retirement assets you want to protect and shelter from market risk. For certain retirees, lower taxes on Social Security benefits. About 40 percent of retirees who receive Social Security pay taxes on at least a portion of their benefits. By reducing eligible income, you may be able to cut the amount of your Social Security benefits subject to income taxation. Someone who ditches their taxable CD and purchases an annuity reduces the income that may trigger the tax on Social Security benefits. Most of the 40 percent of recipients who pay taxes on their benefits will profit from this strategy, but high-income retirees won’t. Greater unpenalized liquidity. Almost all banks impose substantial penalties on all early withdrawals from CDs. Most fixed-rate annuities let you withdraw interest or up to 10 percent of the value annually without penalty, points out. You will, however, have to pay income taxes on any interest withdrawn. Additionally, if you make an early withdrawal before age 59½, you’ll also owe the IRS a 10 percent penalty on withdrawn interest earnings. Annuity expert Ken Nuss is the founder and CEO of AnnuityAdvantage, a leading online provider of fixed-rate, fixed-indexed and immediate-income annuities. He launched the AnnuityAdvantage website in 1999 to help people looking for their best options in principal-protected annuities. More information is available from the Medford, Oregon, based company at https://www.annuityadvantage.com or (800) 239-0356.